At my very first job in D.C. I learned the fascinating history behind combining rice and fish into one of my favorite meals. 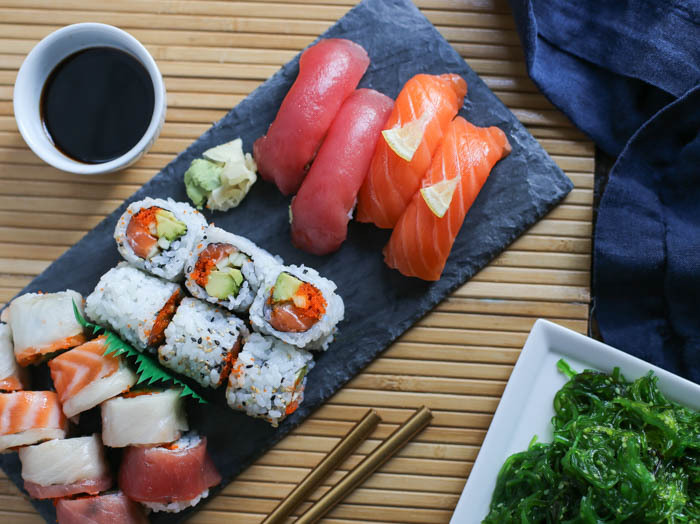 Here’s a closer look at the history of sushi, from its humble origins to street food to high-end dining. The first time I had sushi was in New York, and once I tried it, I ate it every day for the next five days I was visiting there. But it wasn’t until I moved to D.C. that I became a true sushi aficionado. I started working at a high-end sushi restaurant in Penn Quarter. The fish was fresh every day and the chefs got creative with some amazing combinations. To become a server, the first requirement was reading a book. I cannot recommend it enough – The Story of Sushi: An Unlikely Saga of Raw Fish and Rice by Trevor Corson. The evolution of sushi was much more complex than I could have imagined. Sushi has been in existence for quite awhile, originating sometime in 300-400 BC around inland Southeast Asia. Since the rice farmers there did not have access to fish year-round, they needed to preserve any extra fish to eat later (without a handy dandy refrigerator). So the fish were cured with cooked rice stuffed in the belly, and left to ferment for months or up to a year – lasting much longer than if the meat was left on its own. You can imagine, the pickled fish must have smelled awful tasted great. Eventually, the rice was discarded and the fish eaten. They had to wait an entire year before reaping any rewards. This idea for preserving fish spread throughout China and into Japan, where fish was more of a dietary staple. In Japan, people had more fish around to eat, more regularly. The Japanese took things one step further and began to eat the rice with the fish sooner in the fermentation process, so things weren’t so pungent – the rice lent a sour taste to accompany the fish. Around the 1600s, someone had the bright idea of adding vinegar to the rice to help speed up the process. At this point the fish would only be cured for a few days, and the vinegared rice would add the sour taste instead of fermented rice. The term “sushi” actually refers not to fish, but to rice seasoned with rice vinegar, sugar, and salt. The quick sushi became incredibly popular among street food vendors in Edo (which eventually became Tokyo). It was fast food of the olden days! And people liked it. 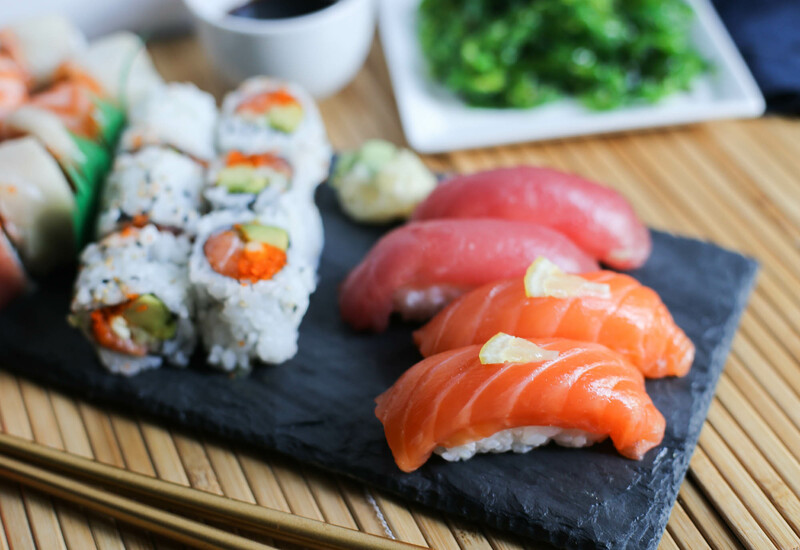 Sushi became even more popular with the invention of nigiri in the early 1800s. Nigiri is a slice of fish served over shaped (rectangular-ish) rice, formed by hand. It was quick, portable, very cheap – meant more as a snack than a meal – and perfect for the hungry working class. Over time, the sushi became more elaborate. For example, ocean fish were added into the mix as a luxury for aristocrats, and sushi became more expensive instead of an everyday snack. 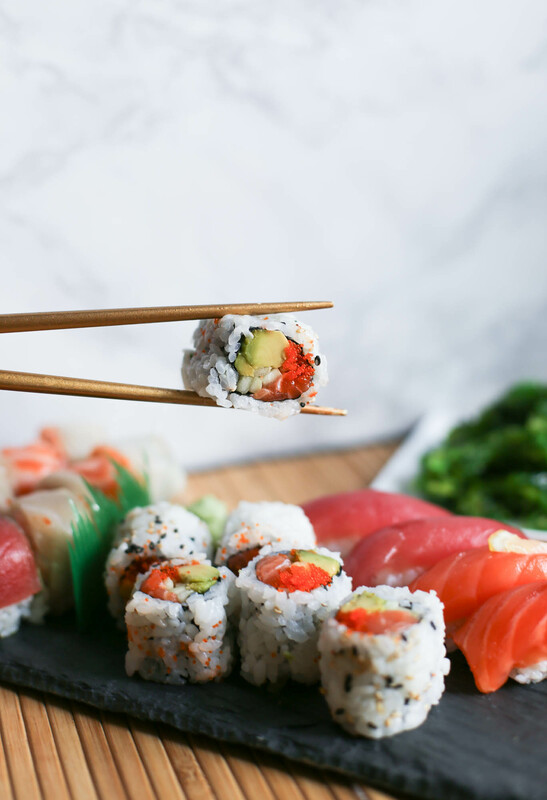 After WWII the street stalls selling sushi were forced to move indoors, and that added to the rise of exclusivity and extravagance surrounding the dish. Chefs very closely guarded their recipes for the perfect rice (and still do). Which is kinda ironic since the rice was originally the part tossed out. Sushi apprentices could work for years just learning how to properly cook the rice. (Have you ever noticed the taste of sushi rice by itself? That probably took years.) What started as a snack became an exclusive, expensive meal, but soon it would be made available to the masses once again. Enter, refrigeration. 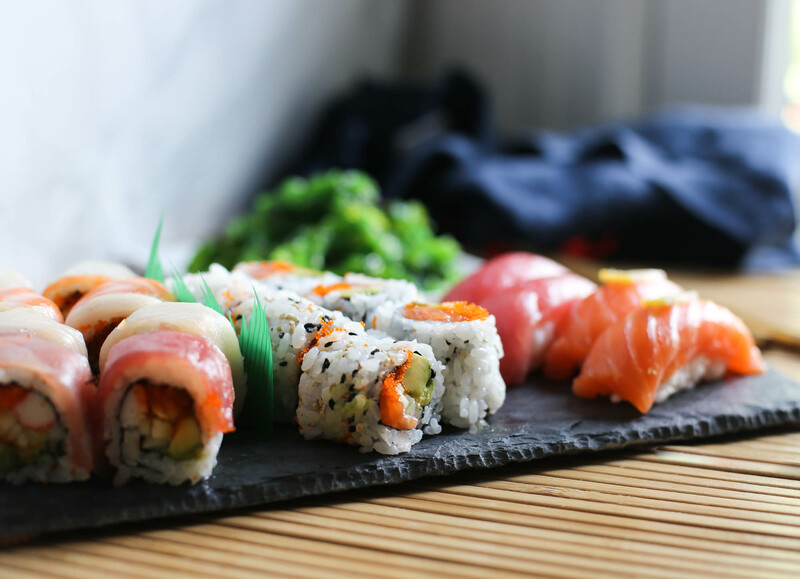 With this wonderful invention, fish could be preserved longer and served raw over rice, wrapped in rolls (known as maki), or even served all by itself – called sashimi. Here’s a great visual breakdown of the transformation of sushi over time. Sushi came to California – Los Angeles, more specifically – around 1855. But it wasn’t until post-WWII that sushi boomed among the American population. In 1966, a man named Noritoshi Kanai opened the Japanese restaurant Kawafuku, introducing the sushi bar to America. So that’s only 50 years that Americans have been eating sushi! We have some catching up to do! Gradually, Americans embraced the cuisine. And the cuisine embraced some American influences as well – hello, California roll. To hide the dried seaweed (ewww grossss) the roll was made inside out, with the rice on the outside – that’s right folks, traditionally the rice was on the inside. Of course Americans preferred the version with more carbs, inside-out. Avocado also helped to replace fatty tuna, and some crab was thrown in because why not? Sushi still had an exotic edge that became all the rage. Sushi has evolved well beyond the traditional Japanese experience, into fusion restaurants and conveyor belts. Now there’s sushi in airports, for goodness’ sake. (No, I don’t recommend that sushi.) Western influences have also created rolls with deep-fried ingredients, cream cheese, mayonnaise, and of course, imitation crab. And don’t get me wrong, these can be incredibly delicious. Such as tempura shrimp in a roll with Old Bay seasoning, a touch of mayo, and avocado. Yum. We love it, we love to hate on it. Even vegetarians can enjoy sushi, which seems…contrary to its origin, to say the least. Let’s just say, the history of sushi is still developing. Ginger is for a palate cleanser between different kinds of fish, not to put on top of the fish, or as an appetizer. Soy sauce should mainly only be used for nigiri, when you dip the fish into the sauce, not the rice. (And don’t be afraid to use your fingers to eat nigiri.) If you’re eating good sushi, the soy sauce will only overpower the delicate flavors. Or if you’re eating some creative sushi rolls, the sushi chef has already put whatever he/she thinks is the best sauce right on the plate, no soy sauce needed. Wasabi served at restaurants is almost always a fake version – instead it’s a mix of horseradish and mustard powder. Only use it for a dab – stirring wasabi into your soy sauce, and then dunking your sushi in it, will basically cover up any flavor the piece had. Miso soup is traditionally served at the end of the meal, not before. Warm sake is cheap sake. Go for the chilled stuff. Also there are many, many kinds of sake, like wine or vodka. So don’t be afraid to ask your waiter for recommendations. If you are also a big fan of the fish, I highly recommend Jiro Dreams of Sushi, a documentary of a world-renowned sushi chef. Even if you don’t eat sushi, which I perfectly understand, it’s a great film. This is the fourth in a series of posts called Food Beginnings. We’ve also covered Easter eggs, wings from Buffalo, and cakes for kings. Check them out!